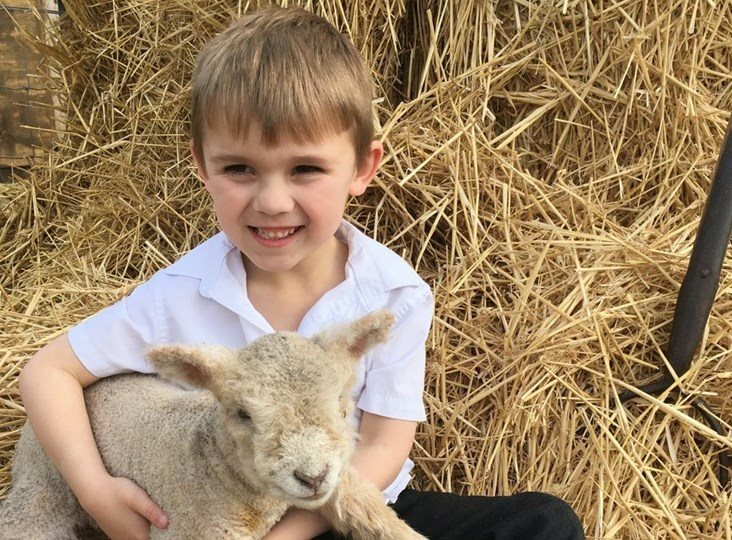 5 year-old wool enthusiast Thomas Bowles was flying the flag for British Wool last week, explaining the benefits and features to his school friends at The Marton Primary Academy. Accompanied by Penny, a Southdown ewe lamb, Thomas presented the benefits of wool to over 100 children during a special show and tell assembly. Thomas talked to the other children about lambing, and demonstrated different types of wool, using Southdown and Texel samples, followed by a game to guess how many items were made from wool. His presentation didn’t stop there – Thomas attended the after school sewing club to talk about wool and felt, creating a replica of Penny the lamb to mark the occasion. Thomas started showing sheep aged 4 with his older brother Jack. He will be entering several classes at this year’s Lincolnshire Show, and also the 2019 British Wool Golden Fleece competition. He lives on the family farm in Lincolnshire with mum, dad and older brother Jack. The family keep a flock of 40 Texel crosses and pedigree Southdown sheep. Great job Thomas – there’s a job in our marketing team waiting for you in a few years!